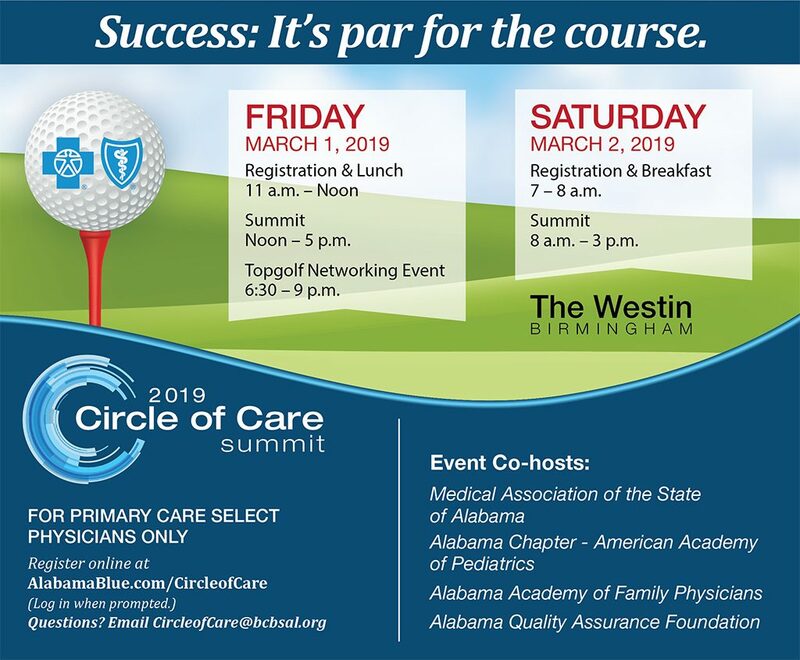 Primary Care Select Physicians may now register for the Circle of Care Summit, March 1-2, 2019, at The Westin Birmingham. Reserve your spot online today! This year’s event is being hosted by Blue Cross and Blue Shield of Alabama and co-hosted by the Medical Association of the State of Alabama, Alabama Chapter – American Academy of Pediatrics, Alabama Academy of Family Physicians, and Alabama Quality Assurance Foundation. All Primary Care Select physicians are encouraged to attend. Session topics and times are subject to change. Questions? Email circleofcare@bcbsal.org for additional information about late registration and registration on site.